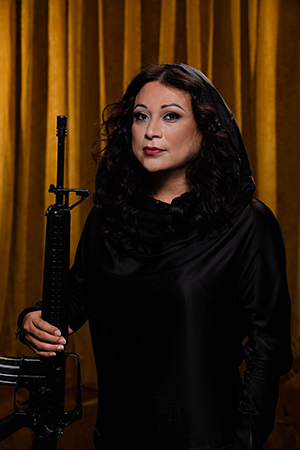 Andrea Bowers, Portrait with Gun and Hood (Jennicet Guttierez), 2016. Archival pigment print. In collaboration with Ada Tinnell. Courtesy of the artist and Andrew Kreps Gallery, New York. The Shelley & Donald Rubin Foundation is pleased to announce The Intersectional Self, an exhibition centered on gender and feminist politics in the age of trans-identity, on view from February 9 through May 19, 2017. Featuring the work of Janine Antoni, Andrea Bowers, Patty Chang, Abigail DeVille, Ana Mendieta, Catherine Opie, Adrian Piper, Genesis Breyer P-Orridge, Cindy Sherman, and Martha Wilson, The Intersectional Self questions how notions of femininity (and alternately, masculinity) have shifted in the context of newly defined gender identities, and how family structures have been subsequently reimagined. Ultimately, The Intersectional Self examines how feminism in its many forms has changed the world as we know it. Sculpture and video works by Abigail DeVille and Andrea Bowers highlight inequities based on racial, economic, gender, and immigrant identities that pervade society. Using found objects and materials, DeVille explains that her process of assemblage is an exercise in acknowledgement. Of her works she says, “I think of trash as…the archeological evidence of the present moment. History is permeating everything, whether you know it or not.” Also serving as a historical record is Bowers’ Roundtable Discussion (2016) that features Patrisse Cullors (one of the founders of Black Lives Matter), Jennicet Gutierrez (an undocumented trans-immigrant activist), and CeCe McDonald (a trans-activist who served time in an all-male prison). Together they discuss black liberation, incarceration, gender, and immigration. Ana Mendieta‘s identification as a Latina and Third World feminist is not only linked to her experience of migrating from Cuba to the United States in Operation Peter Pan, but also her studies at the University of Iowa, a place not associated with diversity in the early 1970s. Her Untitled (Facial Hair Transplants), 1972, coincides with Adrian Piper‘s Mythic Being (1972–75) and Martha Wilson‘s Posturing series (1972–73). Wilson and Piper use performative embodiment to explore ideas of otherness and exploit masculinity, drawing attention to the inequities that women artists faced at the time these works were produced. Through photography, interventions, and video, Mendieta, Wilson, and Piper hone in on the gestures of drag and persona-play performances to show the multiplicity of identities possible at any given moment, and in any given woman. The changing and complicated nature of family is unpacked by Janine Antoni, Catherine Opie, and Patty Chang. Antoni’s Mom and Dad (1994) depicts her parents who have been made-up to look like one another, taking on the other’s gender. Antoni describes the piece as a self-portrait, explaining, “What I was arriving at was a half-mom, half-dad creature, but to create this composite I had to reverse our roles in the sense that my parents made me, and now I was remaking them.” Opie’s Self Portrait/Nursing (2004) challenges stereotypes of the butch/femme dichotomy in lesbian culture, in a pictorial format associated with Old Master paintings of Madonna and Child. In her performance video In Love (2001), Patty Chang demonstrates the intimacy implied by the parent-child relationship by staging a gestural embrace that pushes against the audience’s sense of decorum and comfort.